Heeft u een vraag voor Suite Backpackers Inn? Gerenoveerd in 2013, garandeert het Suite Backpackers Inn gasten een plezierig verblijf in Ho Chi Minh Stad voor zaken of plezier. Gelegen op 0 km van het hart van de stad, bevindt dit 1-sterren hotel zich op een excellente locatie met de grootste attracties binnen handbereik. Een baken van rust en ontspanning: dit hotel is het perfecte verblijf op steenworp afstand van bezienswaardigheden als Bao Silk, Ginkgo Concept Store, Papaya. Het Suite Backpackers Inn biedt tevens vele faciliteiten om uw verblijf in Ho Chi Minh Stad zo aangenaam mogelijk te maken. Dit hotel beschikt over vele faciliteiten die zelfs de meest veeleisende gasten zullen overtuigen. Het Suite Backpackers Inn beschikt over 7 kamers, allemaal smaakvol ingericht voor optimaal comfort, met voorzieningen als plasma tv, internet (draadloos), draadloos internet (gratis), rookvrije kamers, airconditioning. Daarnaast garanderen de talrijke recreatieve mogelijkheden dat u zich tijdens uw verblijf kunt vermaken in het hotel. Wat de reden van uw bezoek ook is, het Suite Backpackers Inn is een uitstekende keuze voor uw verblijf in Ho Chi Minh Stad. Great place to stay when exploring Ho Chi Minh City! The staff were super helpful in booking our trip to Cu Chi. The guide in our bus was very informative and made us all laugh with his jokes. That aside, the hostel also has a wonderful breakfast included in the price. The ladies who cook in the morning are wonderful and super accommodating. I actually stayed one night in their 6bed dorm but liked it so much that I extended to stay in their triple room. I love the staff and bed quality in hostel. Aircon is 24 hours, bathroom water pressure is good and always clean. Even location is good, but for those sleep early could get noise from bar surrounded. Me and my friend we booked without payment, they actually arrange 1 person to stay at lobby and brought us to our room at 4am. After we check in, they did not ask for payment immediately but let us rest for the night. This is very impressive customer service. The room and toilet is clean. With TV channel can watch movie as well. The morning when we checked out, they still offer us to place our luggage and offer us we can take shower before we go to airport. we never expect with this amount of money we can get such service. Definitely will stay there again if we ever go to Vietnam again! The hostel was located in a convenient place in distinct 1. The Sinh Tourist, the famous travel agency, was just near the hostel by within one-minute walking distance. The room was comfortable and the entire environment was clean. You can get free beer or water every night. The breakfast buffet was great and there are different fruits and drinks. I stayed in the private double room with balcony. Room is new and spacious with good TV channels and a fridge. The balcony was large and overlooked the action below. The bed and pillows were perfect. The washroom was modern and hot water was plentiful. The breakfast was bacon and eggs and baguette and custom cooked for you each morning. The staff were professional and courteous. The only con was the late night noise of the bars below which went on past 4am. However, this was not the fault of the hotel but rather is a tradeoff you should consider for this fantastic location just around the corner from the action. For myself, ear plugs did the trick. Really enjoyed my stay here. However, it can get really loud at night because the hostel is located on a very busy road, and near a few night clubs. It was no problem for me, but if you're a light sleeper, bring earplugs and maybe some sleeping pills! Staffs are friendly, helpful and well trained. They arranged temporary bed in dormitory room for us to rest and bath since our room was yet ready due to our early check in. Besides, they also offered us to bath at their bathroom during the period of we back from Mui Ne and before our flight back. Staff try their best to accommodate you and will allow you to place your bags behind the counter if early check-in. Some amount of music can be heard from nearby bars but not to loud if windows are closed and still able to sleep. Beds are big and comfortable. 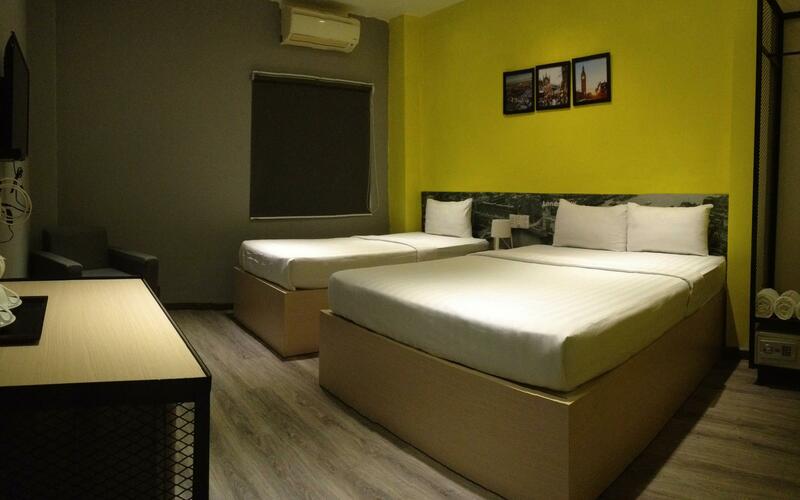 Its advisable to book in advance especially for weekends. I stayed in a 12 bed dorm which was spacious!! There's large lockers next to the beds. The bathrooms were clean and it's such a nice place to stay!! It is located in the heart of back packers district. I made great friends in my room and the staff were helpful. A must stay!! My properties were stolen almost every single day. And for ppl for none English speaking ppl got fake note when they got change at reception . Pros : District 1 area, maybe 8step away from met up office for my CU CHI TUNNEL daytour via KLOOK, value for money. Cons: so noisy during night because near pub area. The hostel itself is good. But it is so loud. There is a club across the street and the music is so loud you can actually feel it. It goes on every night till about 3 a.m. It is really bad. The hot water was good. Bed was Softbank the place gas the cheapest beer around. But I would never stay here again. Well located for young people in the middle of a party district. The saff is super organized and can help you with allyour questions. Where is a good skybar, taylor, the war museum, supermarket and a lot more. But the most important thing is of course the room... we had Denmark, well designed with pictures from copenhagen, comfortable beds and a big bathroom. Aircondition worked well. Nothing more to say. Just perfect! Booked a 6-pax room, which comes with its own private shower/comfort area. Room is clean, bed sheets are replaced as soon as the guest checks out. Few steps away from bui vien, the night life area, so it's a bit challenging to sleep. Pros: central location, free breakfast which is a great time to meet others, social place, spacious rooms, very helpful staff and cleaning lady. Cons: bar beside has really loud music every night and you can feel the vibrations through your bed sometimes.